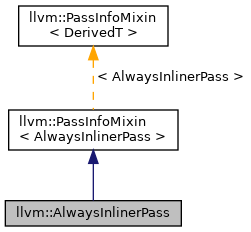 Inlines functions marked as "always_inline". Note that this does not inline call sites marked as always_inline and does not delete the functions even when all users are inlined. The normal inliner should be used to handle call site inlining, this pass's goal is to be the simplest possible pass to remove always_inline function definitions' uses by inlining them. The GlobalDCE pass can be used to remove these functions once all users are gone. Definition at line 29 of file AlwaysInliner.h. Definition at line 33 of file AlwaysInliner.h. Definition at line 34 of file AlwaysInliner.cpp. References llvm::PreservedAnalyses::all(), llvm::SetVector< T, SmallVector< T, N >, SmallDenseSet< T, N > >::clear(), llvm::Pass::doFinalization(), llvm::SmallVectorBase::empty(), llvm::SmallVectorTemplateCommon< T >::end(), llvm::SmallVectorImpl< T >::erase(), llvm::erase_if(), F(), llvm::filterDeadComdatFunctions(), llvm::getInlineCost(), llvm::PassRegistry::getPassRegistry(), llvm::GlobalObject::hasComdat(), INITIALIZE_PASS_BEGIN(), INITIALIZE_PASS_DEPENDENCY, llvm::initializeAlwaysInlinerLegacyPassPass(), llvm::InlineFunction(), llvm::SetVector< T, SmallVector< T, N >, SmallDenseSet< T, N > >::insert(), llvm::Function::isDefTriviallyDead(), llvm::isInlineViable(), llvm::make_range(), llvm::PreservedAnalyses::none(), llvm::partition(), llvm::SmallVectorTemplateBase< T >::push_back(), and llvm::Constant::removeDeadConstantUsers().